The first part of the body I saw was half of the left arm. It hung off the side of the hydraulic roof press, hazy in the dim yellow light of the gas lamps. I walked farther into the machining room, cutting through shadows of pulleys and concrete pillars. Odd flecks of matter on other machines sparkled as I moved. The factory was silent other than a slow drip, like a leaking faucet. Closer now—a black coat sleeve dangled from the steel plates of the press, pinched just below the elbow. A bright crimson cuff encircled a red wrist. A red hand sagged, palm out, five dark droplets stretching from the ends of red fingers, then letting go one after another and plunging into the pool two feet below. The room smelled of a butcher shop—viscera and blood. I crept past the drilling machines and looked down the aisle. The lower half of a large man hung from the front of the press, trousers shiny black above dark-stained stockings and garters. His black button-top shoes, heels pressed against the machine, leaked still more droplets into the dark pool only a few inches below them. The body was upright and complete to the waist. It ended there, where the upper and lower plates of the press met, as if the rest of the man had simply disappeared. My first thought was of a terrible accident, but the Anderson Carriage Company’s machine operators didn’t wear suits, and no one would have walked away from this at six o’clock. I covered my nose with my handkerchief, crept nearer the puddle, and looked inside the trousers. The torso was huge, easily fifty percent larger than mine. The tops of the hipbones were sheared off, the rest a mess of blood and tissue. Acid burned the back of my throat. I tasted bile and bourbon, and spun away from the body just in time to spray vomit across a stack of sheet aluminum. Hands on knees, I retched until my stomach was empty. When I could look again, I wiped my mouth and edged to the other side of the machine. The right arm hung in the same position as the left, but a gold ring encircled the beefy fourth finger of this hand. I reached out for the dripping ring finger and faltered, but steeled myself, took hold of the slippery wrist, and raised the arm. It was heavy but moved freely, like the arm of a huge marionette. I held the hand up near my face and ran my thumb over the ring. ‘University of Michigan’ glinted out between thin crimson lines, with ‘Football’ and ‘1908’ engraved on the sides. Now I saw a black monogram on the sleeve, almost obscured by blood—J.A.C. I let go of the wrist and jumped back. The arm thumped against the side of the press, and blood sloshed around my shoes. I backed away, reaching behind me for obstacles, not able to take my eyes off the ring. My heel and then my back hit the wall of the old battery room. I stopped, perhaps twenty feet away from the press, absently wiping my hands on my trousers. The factory was still. This was insane. Cooper had called me at eleven, demanding I meet him in the machining room at the factory. I told him to leave me alone. We hadn’t spoken in months, and I had no intention of beginning now. I was afraid Elizabeth had finally told him what I’d done, what she’d done. But he said she was in trouble and needed my help. Against my better judgment, I came. From outside the room, a scuffle of boots on the concrete floor broke the silence. I whirled around, looking at the open pair of four-foot-wide doors that connected the machining room to the rest of the factory. Yellow light bounced up and down in a manic dance on the stack of pallets outside the room. The footsteps got louder, echoing like an advancing army. I panicked. I ran to the back of the room and jumped onto one of the workbenches, threw open the window, and dove headfirst onto the macadam below. I hit the ground hard, but scrambled to my feet and hurtled across the test track to the field behind. With only threads of moonlight to guide my way, I crashed into the tall grass and immediately came down on a rock. I tumbled to the ground. Bolts of pain shot up from my ankle. Behind me, shoes hit pavement with a percussive scrape followed by a thump and a curse. I jumped up again and ran, as best I could. Whistles screeched, men shouted, and the light of lanterns bobbed off the trees and grass. Surging adrenaline masked the pain in my ankle. I raced alongside the tracks past the Detroit Foundry Company and over Grand Boulevard, instinctively heading south toward my apartment, passing row houses, factories, and warehouses. The sound of the whistles faded, and the lights gradually dimmed until I could see them no longer. I dropped to the ground at every sound, every passing streetcar and wagon. When I reached East Ferry Street, I crouched behind a tree. Clouds of steam huffed from my mouth as I peeked out, looking and listening for pursuers. I reached for the bill of my cap to pull it down farther onto my forehead, but it wasn’t there. Now I saw that my hand was stained with dark splotches. I squatted and ran both hands through the frost-covered grass, the palms and the backs, over and over, erasing John Cooper’s blood. My hands finally clean, I stood again and leaned against the tree, trying to think. The machining room’s concrete floor was covered with my bloody footprints. My touring cap was missing. 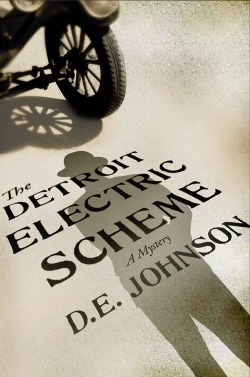 The car I had signed out from the Detroit Electric garage less than an hour ago sat—by itself—at the curb next to my father’s automobile factory, where the man who was going to marry the woman I loved lay crushed between two blocks of steel. I straightened my clothing and limped the last six blocks to Woodward, trying to appear at home in front of the mansions lining East Ferry. From there I took a streetcar the last mile to the corner near the pretentious apartment building on Peterboro where I had lived for the last year-and-a-half. The building loomed like a toy castle, gray granite with towers and turrets, but only three stories high. I crept up to the front door, digging into my pockets for the key. I cursed. In my haste to meet Cooper, I’d forgotten to bring it with me. I hurried around to the back door, gripped the knob, and jerked up on it while giving a hard twist to the right. The door popped open. I silently thanked my landlord for his laziness and let myself in, treading softly on the stairs, hoping to reach my apartment unnoticed. “No.” He’d asked before. I’d always declined—politely. But now I couldn’t stop shivering, and the bourbon in my kitchen was calling me. I opened my apartment door. Without turning around, I said, “No. Thanks.” I flipped on the lights and swung the door closed, then hobbled to the kitchen and grabbed one of the bottles of Old Tub from behind the flour and sugar in an upper cabinet. I took a long drink, and another. It wasn’t fair. I slammed my fist onto the kitchen countertop. A sob escaped my throat. I tried to choke down the next one, but the thought of Elizabeth grieving John Cooper opened the way for the events of this night to catch up to me. I fell to the kitchen floor with my head in my hands, crying for Cooper, crying for Elizabeth, but mostly, I’m ashamed to admit, crying for myself. Some time later, I stood and leaned against the icebox, lighting a cigarette with shaking hands. I picked up the bottle again but hesitated. My mind wasn’t functioning very well as it was, and I needed to think. When I set down the bottle, I noticed a dark smudge on the white linoleum floor. I bent down and ran my finger over it, coming up with a crimson smear. Shocked, I looked at my black oxfords. The shiny finish was dulled and streaked. Dark spatters blemished the cuffs of my brown tweed trousers. My mind again filled with images of Cooper’s torso and legs, his hands, his ring, his blood. I pried off my shoes with my toes and dropped them in the garbage pail. My trousers, stockings, and garters followed them. I threw on some clothes, hiding my features with the flipped-up lapels of my tan duster and a black derby pulled down around my eyes, then grabbed the trash bin and hurried to the door. There I stopped and listened for a moment. It was quiet. I began to open the door but stopped short, remembering that the key to the Victoria was still in the pocket of my trousers. I fished them out of the trash, pulled out the key, and dropped it in my pocket before opening the door and peeking into the hall. Seeing no one, I crept down the stairs with the trash bin and slipped outside to the muddy alley behind the house next door. Almost no light shone here. I could just make out the vague rounded shapes of the metal garbage cans lining the alley, but I had no trouble finding my way. It was a late night trip I’d made many times before, though this was the first time I was carrying anything other than empty bourbon bottles. I pushed aside some of the contents in the first can and emptied my trash bin into it. A small animal bolted away, startling me. My arms jerked back, and the metal bin hit the side of the can with a clang. I stood motionless for a moment, listening for a response. When I was as sure as I could be that no one had heard, I covered my clothing with the other trash and retraced my steps to my apartment. Along the way I examined the carpet on the landing and hallway, and the finish of the maple stairs. There were no stains I could see. I slipped back into my apartment and scrubbed the bloodstain off my kitchen floor. My mind raced. I couldn’t go after the Victoria or my cap even though they were certain to lead to me. Being seen near the factory was too big a risk. If the cap was in the machining room I could say I’d left it there earlier. But the Victoria would seal my fate. The garage’s record book would show I had picked up the automobile at 11:30 PM, thirty minutes before the police found it next to the building that contained John Cooper’s freshly crushed body. I could report the automobile stolen, but with it sitting next to the factory no one would believe me. I couldn’t very well say anyone else had left it there. No one but me had driven the Victoria for months. I had to change the record book, to make it feasible I had left the automobile there earlier. To do that, I would need the cooperation of Ben Carr, the night supervisor. It was my only chance. I again donned the hat and coat, and limped back to the Woodward Line streetcar stop. After what seemed an interminable wait, the southbound car came in. I dropped a nickel into the fare box and sat on the scarred wooden bench-seat in the back row. Scattered about were eight other people, most of them asleep. The car started up with a jerk and began to rattle down the track. I shivered and snugged the duster around me. Twice, the conductor walked down the aisle, giving a gentle kick to the feet of his regulars, waking them at their stops. My head felt heavy and dull. Raucous curses and laughter poured from a few saloons on the way, but most of the city was quiet, a huge mausoleum in the cold night. When I disembarked in the business district, I hurried to the Detroit Electric garage, leaning into the frigid Canadian wind whistling in from across the river. I passed our tiny showroom with a few automobiles lurking in the dark, and skirted the brick pillar that supported the right side of the red iron archway overhanging the main entrance and garage doors. I took a deep breath and rapped on the window in the door. A few moments later, Ben Carr peeked through the glass. He was a small man of about fifty, with elfin features and a sharp chin, dressed in the chargers’ gray-striped coveralls. I stepped inside, wincing as I came down on my injured ankle, and closed the door behind me. “No, but I wanted to talk to you about that.” The garage buzzed with the sound of stored electricity and smelled of ozone, like the fresh air scent of an approaching rainstorm. I looked around the shop. Dozens of shiny blue, green, and maroon Detroit Electrics lined the room, mostly the coach-like coupés and broughams with a few open-bodied runabouts and Victorias sprinkled in. No one else was in sight. I put a hand on his shoulder. “I’m fine, Ben. I just need a favor.” My voice trembled. “Okay, uh, Will.” The name that had come so easily from his mouth when I was a child now stuck in the back of his throat. He hesitated a moment before nodding his head. When I limped out the side door, he was looking down at the floor, his forehead creased in thought. I finally got home around three o’clock. Leaving the lights off, I grabbed one of the bottles of bourbon from the kitchen and hobbled to the sofa in the parlor. I sat sideways with my feet up and took a long drink. The bottle shook against my lips. My ankle was swollen and throbbing, and I knew I should ice it, but it seemed just too much effort to chip off the ice. I lit a cigarette and lay back, trying to still the tremors in my hands. In the dark, all I could see was half of John Cooper’s body dangling from the maw of the gargantuan press, one swallow away from disappearing altogether.